“We chose Egnyte because its advanced features and flexibility promised to help our global organization collaborate more efficiently and effectively,” said Barbara Tencza, Director of Information Technology, Campbell Ewald. “This was the first time we have done this type of large-scale EFSS migration and we could not have successfully completed this without Tervela’s support and their software’s ability to migrate our file permissions and metadata, which was an important requirement for the advertising agency. The reporting gave us insight into what was going to happen, and validated what happened, giving us confidence in both the process and the outcome.” – Barbara Tencza, Director of Information Technology, Campbell Ewald. Campbell Ewald is a full-service, fully integrated marketing communications agency which offers content and channels that bring people and brands together. To pull it off, hundreds of its employees must be able to collaborate and share their data in the most flexible, secure and productive way possible. Campbell Ewald made the decision to standardize its file storage and collaboration on Egnyte. This meant they needed an efficient and secure method to migrate from their current EFSS solution to Egnyte, all while providing users with continuous access to their files and also bringing over important permissions and metadata to Egnyte. Mirroring permissions and content ownership relationships from its existing could deployment to Egnyte would allow Campbell Ewald’s employees to more quickly adopt the new platform and maintain important context of their data. To accomplish this, Campbell Ewald chose Tervela’s Cloud FastPath as its migration solution. This made the operational part of the migration transparent to end-users, giving them constant access to their files and an effortless change to Egnyte. 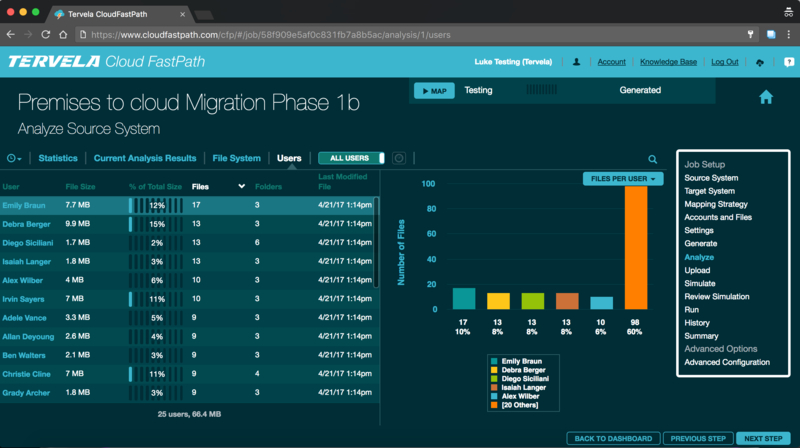 Cloud FastPath’s pre-migration simulation capabilities along with powerful user and permission mapping features provided clear and demonstrable ROI. By simulating and analyzing the results of the migration before moving a single file, Campbell Ewald was able to validate that the correct files and folders were going to be moved onto Egnyte, and that the applicable sharing and permission attributes would be accurately moved along with their corresponding data. With Cloud Fastpath, Campbell Ewald was able to predict the outcome of moving to Egnyte, while making the changeover process apparent, so there was no interruption in servicing their clients. Campbell Ewald is a full service, fully integrated marketing communications agency with offices in Detroit, Los Angeles and New York whose mission is to create fans of brands and endorsers of products by igniting conversations and experiences that demonstrate how brands enhance consumers’ quality of life.